﻿ Genesis Global Systems Inc. » Technology » Industrial Technologies » CTJ "Coil to Floor"
Coil to Floor Technology (CTJ) provides licensees with the latest technology and process to provide their regional markets with a very new building technology. The CTJ Production Line allows every licensee the ability to manufacture finished joists from light gauge steel coil material. This technology includes order control technology along with the latest in steel forming, punching and fastening technologies in an efficient, fully integrated manufacturing solution. 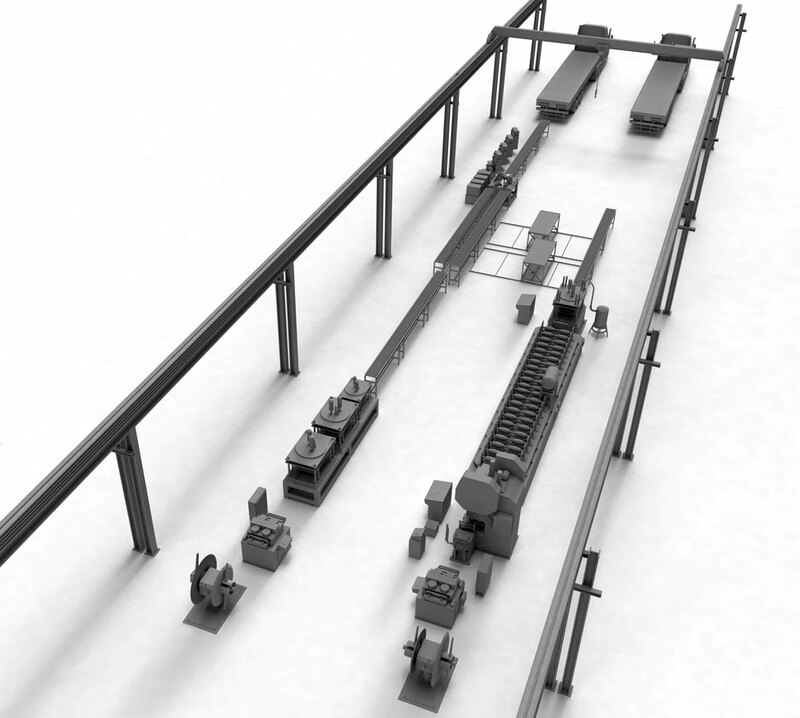 From its integration to Work Orders and bar coded labels through to the efficient bundling and loading process, the CTJ Line offers the latest manufacturing and building technology innovation. Coils of various sizes and gauges are loaded onto the Double Ended Un-Coilers via the specially designed Overhead Crane. On one side we have a heavy duty state of the art roll former producing the top and bottom chord. On the other side we have another state of the art machine producing the web. The chord then transfers to the Run-Out Rollers where the chords and web join to form the joist. Automated tabs push both top chord and bottom chord onto the web prior to the joist entering the four head automated Self Piercing Rivet Station. Self piercing Riveting is the latest technology used throughout Europe, especially in the high end automobile manufacturing industry. The joist is then automatically riveted to exact spacing (as per engineered drawing). Once the joists roll off the line they are bundled in tens then with the custom Overhead Crane are lifted and loaded onto flat bed trailers. (As the joists nest within each other the bundle of ten measures only 12 inches across, maximum length 35 ft.). All of this is accomplished with 4 line workers and 1 maintenance man producing up to 400 joists per shift. The space required for such a plant is 15,000-20,000 sq. ft.
575v/480v/380v, 50/60Htz 600 amp service to building. Our research on how light steel is bent, shaped and fastened together and how components interact together once fastened, has led to a unique development of innovative products such as the floor joist product line. The floor joist system consists of symmetrically shaped, variable gauge, light-steel floor joist, joist chords internal and external distribution beams, snap-in bridging, end connectors and blocking components that can be used as the flooring system in both resident and commercial building construction. The flooring system can be installed quickly, offering superior performance and its simplicity makes it the most trade friendly system available. Our light-steel floor system allows for longer spans (up to 32 feet) far beyond conventional floor systems.